Blame it on my birthday this week: I’ve been thinking about all the accessories of my long-over childhood, like that Hello Kitty lunchbag and thermos I just had to have in fourth grade. I know, I know…how chic can a “go cup” be? But if you’re from the Deep South, you understand its importance-nay, necessity-in adulthood: in the French Quarter you can carry (note: not operate a motorized vehicle with) your drink on the street if you have your beverage of choice in a non-glass container. And for those of you who don’t indulge, did you know Starbucks gives you 10 cents off your drink order if you bring your own tumbler? 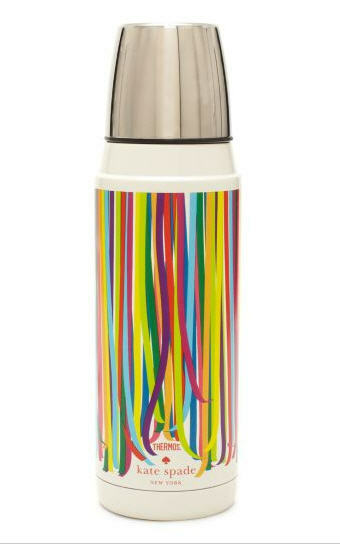 This super cute and festive Prize Ball thermos by Kate Spade ($35) has a party on the outside to match whatever party beverage you prefer to pour inside it! Speaking of which, if you’re in the vicinity of a New Orleans Original Daiquiri shop or Fat Tuesday, make sure you try the Cajun Eggnog daiquiri! Please indulge responsibly.